Repeating a timeline of the troubles we’ve seen in Australian chiropractic over the last few years runs the risk of boring you all to tears. But, it is important. It is important to remind those who are meant to be exemplars of good practice in this regulated health profession that there are indeed standards upon which some – indeed, more than others – of these registered health practitioners should be be keeping an eagle eye. It’s not hard. There are lists of things a practitioner cannot do. It is even written out for them. How good is that? Chiropractors should encourage their patients to make informed health care decisions and to consult their GP in relation to the risks and benefits of vaccination. The unethical use of websites to claim cures for conditions that cannot be supported by research evidence continues to be a major problem for the profession. At the time of the NDF [National Development Forum], the CBA had received 155 new complaints regarding the inappropriate use of websites. This is an issue that continues to astound me. Maybe when some of you receive substantial fines or suspension you will understand the significance of your selfish and unprofessional actions. The damage to the profession from the unprofessional use of social media – personal attacks on chiropractors who might hold different views to you, bragging about entering hospitals without permission and posting photos with well known speakers openly critical of vaccination are not acceptable. Complaints to the CBA have been lodged and some of you will be subject to disciplinary action. Once something is posted on the net it is in the public domain. Private or closed sites are being accessed and trolled. I feel it is time for the profession to change the way it tells its story. It is my personal belief that the concepts of conservatism, holism, vitalism and naturalism are central to the practice of chiropractic. However it is my opinion that the discussion of these and other philosophical concepts should take place within the profession. Our external communications should more accurately reflect the nature of our interaction with our patients and be consistent with being a mainstream health care professional. It should also create unity within the profession. Indeed, dad is angry because the kids are spoilt brats who keep giving everyone the bird and stacking the Beemer. It is only fitting, then, that the very Facebook group to which Tassell alludes – where the “bragging” about sneaking into hospitals was uncovered in 2013: the Australian Chiropractic Philosophy Society (ACPS) – is the very same group from where today’s evidence was also collected. One question which does indeed get answered for us is the question of appropriate practitioner conduct in the privacy of the clinical setting; where only the businessperson and the customer are privy to what is done and said. It has long been thought that no matter what empty threats of sanctions are huffed-and-puffed by the CBA; and no matter how much this does indeed coerce some chiropractors into behaving like healthcare practitioners on social media; there is little that can ever be done to ensure that the privacy of that clinical setting is not abused by any practitioners. There are really only two ways in which the community or regulators can find out what is happening inside the clinic. The first method we have of finding out what is going on is when a customer makes a complaint about information being provided by their chiropractor. Realistically, this is just not going to happen. The customers are in for a penny, in for a pound with the chiropractic faith. Simon Floreani was cautioned for retaining anti-vaccine misinformation at his business, long after the CBA’s taunts; but, we can only guess what is happening inside the treatment rooms, and guessing doesn’t help anyone. Adam L Smith practice[d] his business at the Surfers Paradise Chiropractic Centre in Queensland. In May 2013 he shared a petition created by Meryl Dorey, Australia’s most notorious anti-vaccination zealot. The petition is based on a lie. The title gives it away: Stop the vilification of parents whose children have been injured or killed by vaccines. So your point essentially Scott is that because a lot of people believe injecting their kids with poisonous chemicals that may or may not actually work, everyone should. There are so many things wrong with the THEORY of herd immunity that I literally can’t even start that discussion typo on my phone. My only point I will make on it is that those who are well read, researched and knowledgable on the topic invariably choose not to vaccinate their children. Yet those who believe everything in the newspapers and media, and thoughtlessly roll up their own sleeves for flu shots etc do vaccinate. The former boost their kids immunity and health in other ways and so far I have not read a media report of an unvaccinated kid dying from any of these diseases. It’s the supposedly protected, vaccinated kids who are getting sick and dying from the very diseases they are supposedly immunised against. Why, if vaccinations really work is this the case? Also, sorry for the addition, but the drop in polio cases is not ‘thanks to vaccination’ there are so many other factors at play that reduced the spread first, well before the vaccine was even developed. I’ll include some more of Smith’s businesses’ Facebook posts, which I believe are in breach of the National Law, down the page. And I’ll include relevant sections of the Code of Conduct, the Social Media Policy, and the Guidelines for advertising a regulated health service, in an addendum at the end of this post. I will also include two ACPS group threads in further addenda at the end of this post. There is just too much to include here. What are some thoughts everyone on actions we can do for this No Jab no pay Bill? Crown funding for legal council? Anyone know a good Lawyer that would take this on? Trent Headlam November 24 2015 at 20:48: Yesterday I posted a pretty serious comment regarding the groups thoughts on the new laws passed that discriminate against Australians right to non-discrimination of health choices for there families. Thank you to Clinton McCauley Stephen Kirby and Clare Molino for your comments and contributions. Is there only 3 people in this group that care about this? 1st we have our rights to give patients unbiased information on vaccines, now they are taking government subsidies away if you don’t vaccinate.. What’s next??? Banned from daycare? Banned from public school? Then what? Legally mandated immunisation for every Australian? This is not a vaccine debate it is a freedom of speech, choice and a right to non-discrimination. Braddon Atkinson November 24: Hey Trent, whilst I agree that your question might be directed towards our rights with freedom of speech. It is based around a topic that is too heavily scrutinised to run the risk of public commentary. – Plenty of people in this group will give you stories of issues with comments ad posts being taken out of context and reported to authorities. As much as I understand your frustration I think people realise it is safer to not open themselves up to exposure about this topic. Personally I think they have that right to do so without being ridiculed for it. Adam L Smith November 24: Exactly Braddon Atkinson. I am one of those people who can show you exactly that. I am apparently ‘Australia’s 11th worst anti-vax Chiro’ – and that came from 1 FB post about the original law… I have strong personal opinions but publicly on FB you can’t express them without it costing you time, stress and even actual money in lawyers fees. Adam L Smith November 25: The lost was incurred several years ago when the CBA adopted into law a specific section of the code prohibiting is from discussing vaccines. This meant that any troll with a vested interest felt he/she had grounds for filing a complaint of the mere word is uttered. Trying to wage war against vaccines and big pharma on Facebook is in my opinion useless and just opens us up for ridicule and attack. I talk with my patients about the evidence that exists and let them make their own choices. More and more often the choice they make is to alter or stop the schedule for their kids. It is not my place to tell anyone what to do on this subject. especially not on Facebook. I do t think the war is lost, this is just not the battlefield. The conversation usually ends there unless they ask about my own kids and what we do as a family, in which case I tell them. As we have already seen, above, Smith states that immunisation is “injecting [your] kids with poisonous chemicals.” I’m glad he sorted that out for us. For whoever in this forum is passing screenshots to certain bloggers and other trolls, please pass along all of my comment not just parts. To be clear, I do not discuss vaccination nor do I give advice on vaccination to my patients. I tell them I can’t advise them, and that they have to do their own research. I then respect whatever decision they make, and get on with the day. Further to my comment right at the top, even in this inter-professional forum comments are taken and used by the media against us. Please be aware that even though no patients or members of the public (should) have access to this group yours and my comments will absolutely make it out there. As noted, the full thread will be included below. I strongly encourage you to have a read of the whole thing. It is enlightening. In it you can see how subluxationist, or vitalistic, chiropractic has much in common with cults: if you do not submit to the teachings of the cult you will be vilified; you will have your character questioned and you will be smeared by the thought leaders. On Adam L Smith’s business pages we can see that subluxationist chiropractors are clearly not listening to the Chiropractic Board of Australia. These chiropractors know they will not face any serious sanction. They know the CBA will take over a year to investigate any allegations of breaches of Codes and Guidelines. They know that, even if they are found in breach, nothing will happen to them. They will get a small slap on the wrist, in private, like a toddler caught defecating on the cat (again! ): the mortified parent too embarrassed to tell anyone. Those who raise these issues are vilified – they are called pharma stooges, vested interests, or industry shills, who are being well-paid for asking chiropractors to comply with their own damned regulations – by these chiropractors who need to be publicly shamed into removing outrageous claims, like this claim on Smith’s previous business page, asserting that chiropractic can treat autism. This method appears to work more efficiently than the CBA and AHPRA. Remember what Smith admits discussing with his customers, in private, about immunisation. Tell the Chiropractic Board of Australia. Tell the Chiropractors’ Association of Australia. Tell the Australian Health Practitioner Regulation Agency. Tell your state and federal health ministers. Tell your state’s federal senators. Tell your private health insurance providers, who subsidise these bizarre vitalistic practices with your contributions. Rational chiropractors grab your metaphorical pitchforks in outrage. This is not good enough. This enduring regulatory and legislative silence, with its lack of transparency, will not do. It cannot pass. This anti-vaccination-infected, faith-healing cult masquerading as legitimate healthcare cannot continue. This will not do. Ben Moore: It won’t be easy to change this policy. You’ll need to find/develop good quality evidence to prove that vaccines are harmful. If you can prove that then you have a starting point to remove the no jab no play law. What won’t help is attributing made up quotes to a tyrant. Clinton McCauley [see more here]: Apparently by 2018 anyway the family tax benefit part a and part B are not going to be paid out any more. The budget of 2018 has not included those payments. Therefore that means they will get their pay for three years and then no one will get paid no matter what their vax status. Ben Moore, I have seen that quote attributed to Hitler several times, do you know who actually said it if it is not true. I am just interested. Ben Moore: Clinton McCauley. Google suggests the quote comes from the eleventh chapter of a book entitled Wilfully Ignorant by Pat Miller. Clinton McCauley: Thanks Ben!! Suits Hitler better or maybe Obama!!! Trent Headlam November 25: Thanks Braddon, I was not attempting to ridicule anybody and I’m sorry if it came across that way. Trent Headlam November 25:Adam can u pls send me which part of the code actually mentions that I can’t seem to find it? Adam L Smith November 26: http://www.chiropracticboard.gov.au/Codes-guidelines/FAQ/Position-statements/Provision-of-health-information.aspx – that is one link, and this is usually the page the trolls refer to. Alex McLennan November 25: The only way to give unbiased information, as a Chiropractor, on vaccines is to say “That’s not in my scope of practice. You’d be best off talking to your GP about that”. The new laws are not discriminatory. They aren’t forcing anyone to do anything they don’t want to. They are removing one of the conditions for financial support for families. It may have the benefit of boosting vaccination rates in those who have forgotten, but it is unlikely to force anyone into vaccination if they have a preconceived view that they are evil and cause more harm than good. I would guess that most parents agree that you couldn’t pay them enough to do something they felt would harm their child. Comparing this legislation to things Hitler (may not have) said was not a great way to start a discussion. Calling out colleagues for not being passionate enough to go to jail for your ideology is also not a great discussion point. This is not a Chiropractic fight. By all means protest as a private individual as is your right. Ben Phillips [see more here] November 25: Alex McLennan I have to disagree (hopefully politely) on what you have asserted here. This is a chiropractic fight in two senses. First is the issue of the unfair standard we are being held up to and second is the fact that it is our freedom as health professionals that is being impinged. First, is the scope of practice issue. You (and the Board) are holding us to a false standard – it is innacurate as best (and downright farcical otherwise) to argue that most GP’s have the training, beliefs, independent analysis, time or inclination to truly explore this issue, and therefore they ALSO do not provide unbiased information. Their information is completely biased (in most cases), just in the opposite direction, and they are not required to explicitly inform their patients of this. past to provide; if this is clearly expressed as the rationale behind the information delivered, they should have the right to provide it. There is by all means an argument that their needs to be balance and reference to the other side of the argument. However, if this is the argument as to why chiropractors cannot comment due to being outside ‘scope’ then the same opposite argument applies to the vast majority of medical professionals that also do not give accurate information about risks and such; information needed to help their patients actually give true informed consent. (Many never even give the package insert to their patients – a document which does often highlight more serious risks, even if minute in frequency…funny, don’t we have to provide an informed consent document suggesting that stroke could occur in a frequency of somewhere between 1 in 2mil-6mil? Such a minute risk-frequency, but we have to provide this information as chiropractors – there is no equivalent expectation that GP’s actually bother the give this vaccine data to their patients and for that matter get them to sign a document that says they understand and accept such risk). These professionals are informed by the position that vaccination is of enormous benefit, and skepticism of this is tantamount to heresy. They often belittle patients who ask questions, or ostracise them because they believe so strongly in their position. The fact that this issue in particular (as the only one so singled out) is apparently out of our scope is nothing but political expediency and image control against FOSiM and others that have always belittled our profession. It is not about ‘protecting the public’. The argument is not that we do not have the training or expertise to provide accurate information, it is that the information many chiropractors have historically provided contradicts the dominant position. Clearly this does not hold when we think about other ‘health information’ that we may provide to our clients/patients that we perhaps only received minor training in at a pre-professional level. For instance, nutrition information, exercise, stretches and movement, stress reduction techniques, alternatives to pain management. There are all kinds of areas that we often talk to people about that are not necessarily taught at uni – information about pillows and sleep posture; suggestions for how much sleep someone might need to function at their best…the list goes on. Interestingly the board asserts that the Immunization Handbook is the relevant reference point for accurate information about use of vaccines in Australia. This document clearly states in the disclaimer at its beginning that the Australian government will accept no responsibility for the information contained therein, or harm caused by following the advice provided therein! Now that inspires confidence about it’s accuracy! By muzzling us on this issue, there is now precedent to stop us providing pretty much any information outside of a pure (neuro)-musculo-skeletal framework – something a future board may choose to do, or feel pressured to do. It also takes into no account further training either formal or informal that may have been done after university to become knowledgeable on a given issue. Second, you argue the no jab, no pay laws are not discriminatory. You are completely wrong in this assertion. Many low income families (as a chiropractor you may be unaware of this) deeply depend on these financial benefits to stay afloat. When you are in dire need for a financial supplement, it becomes an instrument of coercion, that can force people into a given behaviour. Vaccination is a medical procedure. It does have risks. If there is ANY form of coercion, financial or otherwise, there can be NO informed consent. This is a basic tenet of what constitutes informed consent. The numbers of conscientious objectors in Australia was, and continues to be very low. The legislation DOES discriminate about these people who have made this conscious choice (and it is rare that someone would register as such, with all the hoops you must jump through to achieve this, unless they had done their own research and come to a decision not to vaccinate). If vaccination is indeed the medical miracle it is claimed to be, education should be used as the primary method of informing people and encouraging their behaviour. The Law Institute of Victoria recently released a public position paper arguing this very point. Trent Headlam November 26: Thank you Ben for a very concise comment. Alex it may be worthwhile checking out the word discrimination..
Can u please explain how these laws don’t fall into the definition of discrimination? Also I haven’t seen any interest in chiropractic philosophy coming from you ever are you sure you’re in the right group here? Can anybody vouch for Alex? Alex McLennan November 29: Ben, I appreciate your polite comment. I think your comments are a little off topic in that they don’t seem to relate to this particular legislation, but I’ll answer them anyway. “Listening to patients, asking for and respecting their views about their health, and responding to their concerns and preferences. It would seem that a central tenant of GP’s working with their patients is to discuss potential harm not just the potential benefits. Also they are compelled to give people ‘adequate opportunity to question or refuse intervention or treatment’. The government policy in question seems to place GP’s at direct odds to their code of conduct. Also I personally could not be paid enough to endanger my children in any situation, but that being said I don’t rely on government payouts to be able to feed my children either. I disagree that ‘this policy is no more discriminatory against the poor as it is the rich’. Your argument that the rich are being discriminated against by earning too much to be eligible for the FTB and therefore are just as affected by the No Jab No Play policy is absurd. If you can’t get the FTB you are by definition not affected by a policy further restricting its conditions of distribution. You comment is similar to saying that because I am not a farmer and therefore cannot get any government assistance for my vegetable garden, I am affected as much as farmers are by the rule changes redefining what is and is not a drought…. It’s just not the same thing. Lastly, no one is forcing anyone to undergo a cervical adjustment. There is no one even suggesting that, because every healthcare procedure carries some risk, and therefore MUST also be able to be refused by the patient (or the patient’s legal guardian) just like the GP’s code of conduct mandates. Alex McLennan November 29: Thanks for the reply Adam, and for answering my general question. Again, the insert issue is irrelevant. We are not required to provide copies of research that we quote our figures from in our own informed consent, except in cases where it is asked for. GP’s and all health care practitioners are held to the same standard. The inserts themselves are long, complex and beyond the understanding of the average lay person. For example, people often misunderstand the line “without respect for causality” when quoting inserts. There is also a common misconception around certain ingredients. There seems to be a general assumption that medical practitioners are hiding the “truth” or misrepresenting associated risks. Some here seem to assume that GPs in particular do not discuss potential harm. Those people then claim to have as much or more knowledge around vaccination than their GP counterparts. Yet there is a stubborn refusal (or perhaps a gulf wide gap in knowledge) to answer another of my questions around the benefits of vaccination. If you are going to hold GPs to account and demand they speak of the harm and good with an intervention, then surely if you are serious that your knowledge is equal or superior, you should be held to the same standard. You yourself Adam, admitted in another post that you find patients opt out or change their mind (paraphrasing to save me time scrolling for your exact words) after discussing vaccination with them. I would ask you the same, if you feel yourself qualified to give advice or information, then what are some benefits of vaccination? Are their any populations that you would say benefit from a strong vaccination program? I don’t follow the logic that this policy is at direct odds to the medical code of conduct. Again, this policy is not forcing people to do anything they object to. I’ll concede my argument against this policy being discriminatory was poorly worded and confusing. The point I was trying to make was the government could be seen to be discriminatory with many policies if you choose to see it so. In order to obtain certain payments, you need to fit a certain criteria. Hence my point being that this policy is no more discriminatory than high income families being ineligible for the FTB. Saying this discriminates against the poor is like saying the government discriminates against obese smokers on the transplant list. It is only holding people accountable for their life choices as a way of measuring out limited funds. Once again, I would point out that this policy is not forcing anyone to undergo a medical procedure against their will. The policy clearly states who qualifies for these payments. It even clearly states the conditions around being unvaccinated and still having access to these funds. Adam L Smith November 29: Yep, I thought you might have worded the whole FTB thing poorly. I understand your point even though I don’t necessarily agree. Here’s the thing Alex, I’m not anti-vaccine by definition (this is a longer discussion than my thumbs can take on my iPhone right now) so I find it humorous that I have been labelled so. I am anti ‘forced vaccination’ in fact, I am anti ‘forced anything’ in relation to healthcare. If I am asked about my thoughts on the government’s policy when sitting on any of the various committees I am involved with, then I will certainly give it, but for now I think we have likely ‘point and counterpointed’ this discussion to a good place to stop. I can certainly see your viewpoint, and even though I disagree with some of your points, I respect your right to have and express them. I also realise that I cannot change your mind in this forum, so I will not waste either of our Sunday’s trying to do so. I hope you have a great Christmas and New Year Alex. Good day. Alex McLennan November 30: Agree to disagree. I appreciate you taking the time to respond and I also hear you on the iPhone thumb issue. Adam L Smith November 25: The danger is always in the question, where is the line between private individual and professional for us Alex McLennan? It has been successfully argued before that ANYTHING a registered chiropractor says in regard to healthcare is deemed professional advice, and as such is not ‘private’. I have a professional Facebook page, and a personal Facebook account, but you can be absolutely sure that my personal account will be screenshot and presented as my professional viewpoint should I type something deemed inflammatory by anyone with a vested interest. Effectively what this situation has done is force us to either not engage in our beliefs or communicate our views, or run the increasingly certain risk of a formal complaint against us that we need to then waste time and money defending. The answer of course is that everyone is in theory entitled to their opinion, and discussing those opinions should be conducted in a reasoned and respectful manner…. good luck with that. Alex McLennan November 25: There is more weight added to what you say if you are deemed a professional in that area. Facebook, like the rest of the internet, for better or worse, is public domain. The board has mandated that we do not discuss things outside our scope. There is good reason for this. Bad information can cost people dearly. There is a way to reduce your risk of being investigated. Just like there is a way to reduce your risk of pulled over for speeding. Stick to the rules. Tim Shakespeare November 25: If this is outside our scope why are university students tested on their knowledge of this issue? Adam L Smith November 25: Good question Tim. I don’t have an answer for that. Tim Shakespeare November 25: What is your point? Alex McLennan November 25: We were also tested on cardiomyopathy. That still doesn’t mean offering treatment advice is within our scope. Especially if our advice is in direct opposition to the current best practice and best evidence on the topic. My point is you are trying to use one or two test questions on a topic that is covered on a basic level as justification for giving out medical advice that directly contradicts standard practice. This also goes to the heart of this matter that really this discussion that Trent started is not out of a concern for the fairness of the legislation but rather is coming purely from an anti-vax/anti-pharma ideology. Using a Hitler quote as an allegory for what you really think about people who vaccinate and those who provide them highlights this discussion has nothing to do with what is in the public’s interest and everything to do with furthering the us vs them mentality that infiltrates a small percentage of this profession. What about identifying neurotoxins for the nervous system? Alex McLennan November 25: Identifying cardiomyopathy is a red flag and offering treatment advice for cardiomyopathy are completely separate issues. What neurotoxins specifically are you referring to? Trent Headlam November 26: You sound like a very frustrated person Alex and it is obviously clouding your judgement. How was the quote from hitler implying anything towards what I think about individuals views on vaccination? It was a quote to highlight the danger of governments taking away basic civil liberties and freedom of choice without coercion in any matter. I hope you find some happiness and peace with your life soon Alex this is an amazing life we are all blessed with so best to enjoy it. Tim Shakespeare November 27: Alex McLennan by identifying risks how are we providing treatment? Alex McLennan November 27: I usually don’t respond to ad hom as it rarely is productive. However Trent, it seems your original post for this thread is muddled. I respect your passion for what you are trying to achieve, but your methods appear disjointed. Your comments show your frustration that more people have not joined the crusade, but belittling people on facebook is never a great way to garner support where little support is present. The last words, “Step up” are very telling when considering levels of frustration. I wouldn’t suggest that your passion is leading to frustration though as I have never met you and I can only gage from from your comments how I “think” you would be feeling. Tim Shakespeare November 27: Please answer my question Alex McLennan. Alex McLennan November 27: Tim, you’re contradicting yourself with your circular argument. You argue here that consulting with patients on vaccines are within our scope. You’re using the same line of argument to say cardiomyopathy is not within our scope. Now, if you please, could you answer my questions. Alex McLennan November 25: How? Paul Lawrence November 25: Should you or the state have a sovereign right over your body Alex? Alex McLennan November 25: How does this legislation take away any of my rights over my body? Alex McLennan November 26: In a vacuum, you should have sovereign right over your own body. Paul Lawrence November 26: You didnt answer the question Alex. Paul Lawrence November 26: So given we don’t live in a vacuum I must assume that you think the state should have control over your body. So answer me how is that not a civil liberties issue? Alex McLennan November 26: No. It’s not black and white and trying to make it so is a poor argument. If you could explain to me why you think this is an attack on civil liberties, then I could give you a clearer counter point. Remembering that this legislation is about a conditional government hand out, like all of their handouts and tax breaks, and service provided. Paul Lawrence November 26: You either have control over your body or you don’t . You can either be forced against your will or you can’t be Alex. The concern in this discussion is the right of the state or otherwise to force procedures on humans against their will. We think they shouldn’t be able to. Alex McLennan November 27: It’s not that Black and White. If we want to live in a community, be it local, state or national, then we must abide by the laws of the land, whether we agree with them or not. The “state” holds us accountable for many different things and when our actions put at risk the lives of others in the community, then the punishment or consequence is much more severe. Look at drink/drug driving as an example. Look at laws around indecent exposure as another example. These are laws with very real consequence if broken that mandate what you can and can’t do with your body. This legislation is not forcing anyone into anything. That point seems to be getting lost in this whole argument. Paul, you’ve stated before your position on vaccination and pharmaceutical’s. This legislation is removing a handout for people who don’t fit a certain criteria. If we look at it another way, how much money would I need to pay you for you to vaccinate or have any medical intervention you were ideologically opposed to performed on your own children? If you truly are a conscientious objector and have been swayed by the research to come to that conclusion (even if it contradicts the best practice and best evidence) then no amount of money would force you into doing something you believed harmed your kids. I expect that what you’ll find from this legislation is that parents who may have forgotten or been slack in keeping up with the vaccination schedule will now have a stronger incentive to keep to the schedule. Remembering there are still medical exemptions to the schedule that allow you to still access the benefits. Paul Lawrence November 27: Alex, if you read Trents post you will see he is asking a question that arises from observing a number of actions by the state. The question Trent asks is “what next”. It is a very valid question when we see our rights being eroded and coercion being used. Perhaps it’s ok if you believe the state only ever operates in the best interests of the people simultaneously ignoring the influence of the powerful, but our eyes are wide open and we are not trying to fool ourselves about what’s happening here. If the state wants to stop people driving drunk bashing and robbing each other we don’t have a problem with that. If they want to enforce mass medication on the population we do. Its a civil liberty issue. You are arguing they should be able to do that and at the same time telling us we shouldn’t be worried because the current legislation doesn’t mandate that. Our concern is that there are other people, like you, who feel the state should have that right and this is the direction they are heading. How stupid would we be to listen to your argument that there is nothing to worry about in the current legislation but you feel the state should have the right to enforced mass medication. You couldn’t contradict yourself more completely. Alex McLennan November 27: Paul, have you read the legislation in question? Can you point out for me where it says that vaccination will be mandatory for all? Can you point to me where it says the state will force mass medication on its people? That idea does not fit with the current government health policies around preventative strategies to improve the populations overall health. (Increase taxes on cigarettes and alcohol, media blitz on losing weight, quitting smoking, recommended screening for cancer, heart disease etc based on age milestones) To suggest that this is some sort of plot by those with power and influence belongs in the conspiracy file unless you have solid proof that that is what is happening. That’s the thing about conspiracies, you don’t need any proof and you can cherry pick what you like to fit your own agenda – chemtrails, false flag attacks, forced medication. You’re still using a black or white argument that doesn’t apply here. You asked me if I believe the state should have sovereign rights over your body. I answered that it is not that simple. You yourself agree that you are ok with the state having some control over our own selves. Paul Lawrence November 27: Sorry Scott. Perhaps I should rephrase my comment Alex. On one hand you appear to support state sanctioned mass medication. On the other hand you tell us the current legislation should give us no concern. Surely if your position is representative of others views we would have every reason to be concerned. Adam L Smith November 30: For whoever in this forum is passing screenshots to certain bloggers and other trolls, please pass along all of my comment not just parts. To be clear, I do not discuss vaccination nor do I give advice on vaccination to my patients. I tell them I can’t advise them, and that they have to do their own research. I then respect whatever decision they make, and get on with the day. Further to my comment right at the top, even in this inter-professional forum comments are taken and used by the media against us. Please be aware that even though no patients or members of the public (should) have access to this group yours and my comments will absolutely make it out there. Paul Lawrence November 30: I’m already answering complaints from the so called sceptics for comments made on this group and noticed a big surge on my clinic facebook page after comments on I made on this thread. Any idea who might be passing them on Alex McLennan? Alex McLennan November 30: Paul, no I don’t. Besides, what could anyone pass on? You refuse to answer any of my questions. This entry was posted in abuse, anti-vaccination dishonesty, australian vaccination network, AVN, chiropractic, meryl dorey, public health, skeptic, stop the australian vaccination network, vaccination and tagged 360 Wellness, Adam L Smith, AHPRA, anti vaccination, Australian Health Practitioner Regulation Agency, australian vaccination network, Australian Vaccination Skeptics Network, Australian Vaccination Skeptics Network - HCCC Public Health Warning, AVN, AVsN, Ben Phillips, Braddon Atkinson, Bruce Whittingham, CAA, CAA QLD, CBA, ChiroPlus, Chiropractic Board of Australia, Chiropractors' Association of Australia, Chiropractors' Association of Australia Queensland, Clair Molino, dishonesty, EPIC Healthstyle, Gordon Benz, Healthstyle Centre Robina, Jillian Natalie Hunt, Life Chiropractic Oxenford, meryl dorey, Nimrod Weiner, Paul Lawrence, Rory Onley, Scott Walters, Surfers Paradise Chiropractic Centre, Tim Shakespeare, Trent Headlam. Bookmark the permalink. Thank you as always mate. We weep. Well, there was *one* reasonable voice present. What the rest can’t comprehend is, the government is responsible for the welfare of the *entire* populace, which means it can induce people to do certain things or not do certain things that risk the majority of the populace. That inducement can be via criminal penalties, administrative fines or refusing to pay for certain services if the individual did not obey the law. With every right there are limitations, be it not inciting a riot with speech, not committing sedition, etc. Rights are certainly not unlimited, as those rights are framed within the boundaries of society, nation and community for the better good of all. The claim of sovereign rights over one’s body, is that an actual right? If so, why does an attempted suicide get arrested? Why are you required to wear clothing if you’ve sovereign rights over your body? No, these people aren’t describing rights, they’re describing anarchy by saying and doing whatever that they want to do, the law be damned. That behavior does eventually have a cost. Hank you are such a troll, calling these people out on their illegal practices. How dare you! They are the victims here. I find it fascinating that they both think that the well penetrated private group is safe to blather their shenanigans on and that they think that their office is secure against enforcement of the law. I’m guessing that their memories aren’t functioning or that they’re so egotistical that they can’t help themselves from constantly compromising themselves and I’m guessing that they’ve forgotten how tiny microphones are today and how easily a warrant can be acquired. 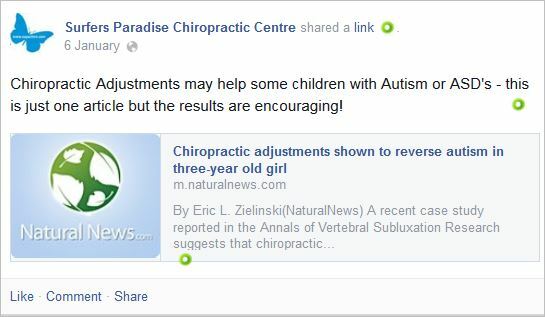 If chiropractic really does have a physiological effect, then wouldn’t the default position of adjusting children from birth through adulthood amount to over-prescribing? I wonder what the long-term impact of this continued and increased over-prescribing will be? More autism? More ADHD? More cancer? I think a look at some statistics might reveal an alarming correlation.